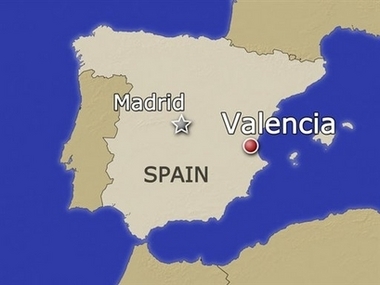 A subway train derailed in the eastern Spanish city of Valencia on Monday, killing at least 34 people, a regional government spokesman said. "Initial investigations show it was an accident," said Vicente Rambla, spokesman for the Valencia regional government. He said there were at least 34 dead and 20 people seriously injured following the derailment and subsequent overturning of the train car. A spokeswoman for Valencia emergency services department said one car of the train derailed when it was leaving Jesus station in downtown Valencia. Some 150 people were evacuated from the station. The accident came as hundreds of thousands of people began traveling to Valencia for this week's World Meeting of the Families, which will be attended July 8-9 by Pope Benedict XVI.